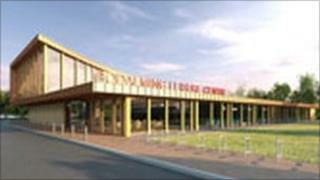 An artist's impression of a new leisure centre planned for Surrey has been unveiled by a local authority. Waverley Borough Council plans to build the £6m facility on redundant tennis courts next to the existing leisure centre in Broadwater Park, Godalming. The council said it was the most cost effective option and would allow the existing centre to remain open until the new site was ready. Construction work is expected to take up to 15 months. When the new facility opens, the old centre will be demolished and the area returned to grass.